The 5 Best Greece Mountain Resorts And Spas. For high altitude, low temperatures and luxury winter escapes, check into one of Greece’s best mountain resorts and spas. Within the Vikos Gorge, this cosmopolitan hotel is 36 km from Drakolimni Lake and 39 km from the natural phenomena of the Stone Forest. Laid-back, fashionable rooms with wood furnishings feature minibars, flat-screen TVs, free Wi-Fi and rainfall showers. Upgraded rooms offer fireplaces or balconies, while suites add Jacuzzis. Room service is available. Complimentary breakfast is served in a refined restaurant with views of the Gorge. There's also a posh spa with an indoor pool, a steam room and a sauna. Overlooking the town of Metsovo, this scenic mountaintop resort is 25 km from the paintings at Averoff Gallery art museum and 24 km from the mountain divide of Katara Pass. Featuring rustic decor and marble bathrooms, the warm suites have free Wi-Fi, flat-screen TVs, and safety deposit boxes, plus terraces, minifridges, and tea and coffeemaking facilities. Upgraded suites add mountain views and/or fireplaces. Greek breakfast is complimentary. Other amenities include a wine bar, a pool and a high-end spa area, plus a fitness center, a cafe and a formal restaurant. 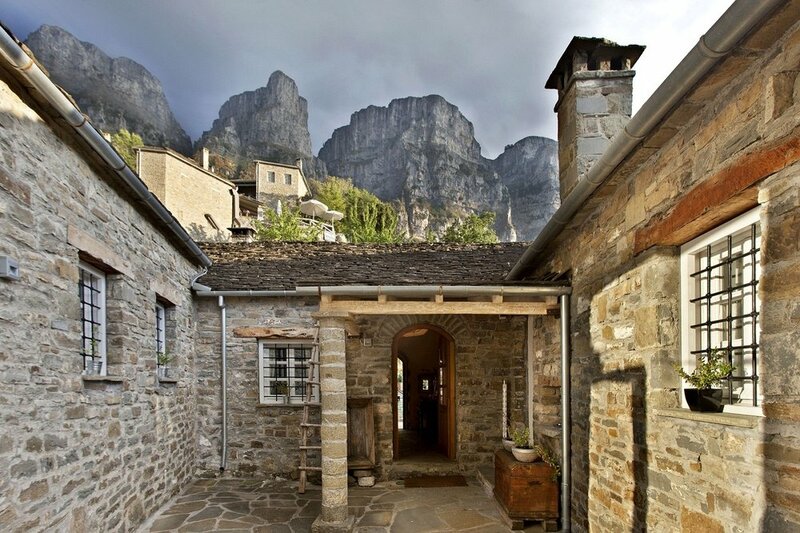 In the Pindus mountains, this rustic-chic, stone-built resort is 5 km from Moni Panagias church and 13 km from Vikos Gorge. Modern rooms and suites, with stone and wood accents, feature minibars, free Wi-Fi and flat-screen TVs, as well as lounge areas and balconies. Upgraded suites add fireplaces and living rooms. There are also 2-bedroom villas with kitchens. Amenities include a restaurant, a bar, and a warm lounge with a fireplace. There's also a spa area with a sauna and an indoor pool. Parking is free. Miramonte is a design hotel that features spa facilities, gourmet restaurants and stylish accommodation with views to Agios Athanasios village and Mount Kaimaktsalan. A heated indoor swimming pool is available. All elegantly furnished rooms feature well-stocked bathrooms with spa bath or hydromassage shower. Luxury amenities, bathrobe and slippers are offered. Each unit has a balcony or courtyard and fireplace. Plasma-screen satellite TVs and free wired internet are standard in all Miramonte Chalet’s rooms. Miramonte Chalet Hotel Spa’s guests have free access to the well-equipped gym, sauna and hammam cabin. An on-site hair and beauty salon is available. Ski equipment rental and storage as well as skiing lessons are offered. The hotel Aroma Dryos uniquely combines tradition with luxury and modern conveniences. Located in the center of Metsovo (just 3 minutes from the square), the point where it is located offers visitors wonderful views of the mountains of Pindus. Made with completely separate way from stone and wood carved by hand, all in the spirit of traditional architecture. The carved oak entrance to the hotel welcomes you in the living room that was built with special care. The decor exudes a warm and elegant feeling.